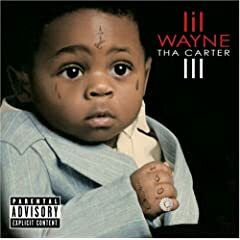 Posts Tagged "the carter III"
A lot of my peers like Lil’ Wayne. Let me rephrase that; they love him! I’ve never really seen or heard the appeal, personally. My cousin knows him. She went down to Miami when the MTV Video Music Awards were there a couple of years ago and happened to run into Weezy and his crew. Ended up spending the entire weekend with him and speaks highly of him. They have stayed in touch and hung out quite a few times since then. But when it comes to his music, I don’t really understand why people are so obsessed with him. Ryan Lochte, I am talking to you! I downloaded his newly leaked album last night and forced myself to listen to it. It was rough. I wanted to skip a number of tracks. It seems the only songs of his I can tolerate are the crossover ones that appeal more to Top 40 radio than Urban; his album collaborations. Those specific songs number less than half of his new CD, Tha Carter III. The songs that were just him rapping over a random and overly repetitive beat — with no distintion between a verse, chorus, or bridge — were the ones I hated. I guess he’s just not my type of rapper. I gave it a shot, though!